Janine N. Pettiford, MD, John Sweeney, MD, Behnoud Berakhim, and Vadim Sherman, MD. 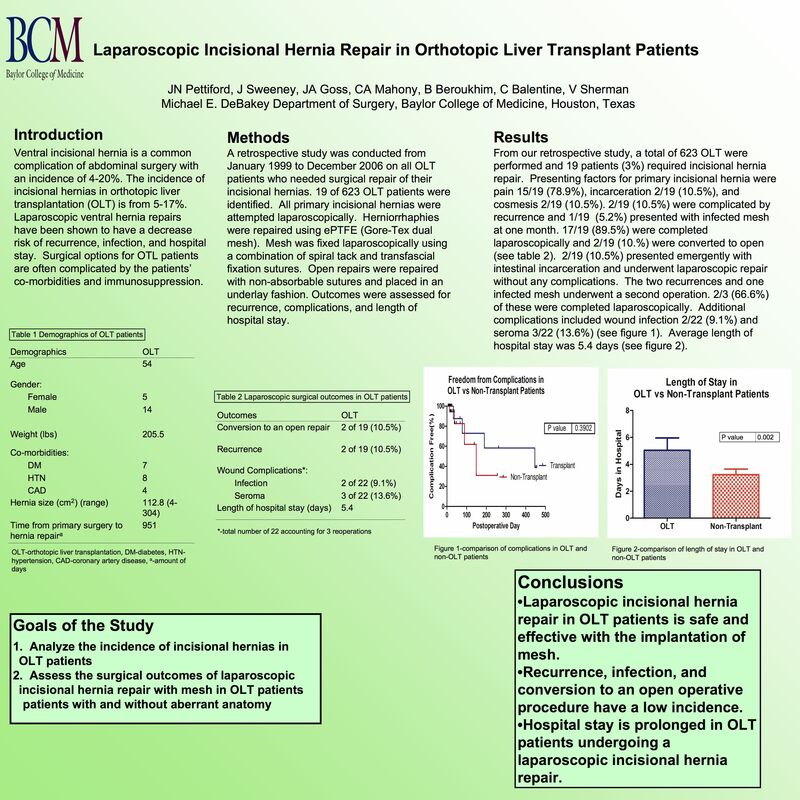 Background: The incidence of incisional hernias in orthotopic liver transplant (OLT) patients is approximately 5-17%. Treatment options are often complicated by the patients’ co-morbidities and immunosuppression. The purpose of this study was to assess surgical outcomes of laparoscopic incisional hernia repair in OLT patients. Methods: OLT patients undergoing incisional hernia repair between 1999-2008 were retrospectively reviewed. A total of 19 OLT patients underwent 22 incisional hernia repairs. Outcomes were assessed for recurrence, complications, and length of hospital stay. Patients were evaluated for surgery at least 6 months post-OLT and after being off Prednisone for 6 months. Results: Presenting factors for primary incisional hernia were pain 15/19 (78.9%), incarceration 2/19 (10.5%), and cosmesis 2/19 (10.5%). Two of these patients (10.5%) were complicated by recurrence and one patient (5.2%) presented with infected mesh at one month. All primary operations were attempted laparoscopically with 17/19 ( 89.5%) being completed laparoscopically and 2/19 (10.5%) converted to open. 2/19 (10.5%) presented emergently with intestinal incarceration and underwent laparoscopic repair without any complications. The two recurrences and one infected mesh underwent a second operation. 2/3 (66.6%) of these were completed laparoscopically. All 22 herniorrhaphies used ePTFE (Gore-Tex dual mesh); mesh was fixed laparoscopically using a combination of spiral tack and transfascial fixation sutures. Nonabsorbable sutures were used for mesh fixation in open repairs. Additional complications include wound infection in 2/22 (9.1%) and seroma in 3/22 (13.6%). Average length of hospital stay was 5.4 days. Conclusion: Laparoscopic incisional hernia repair in OLT patients is safe and effective. Despite immunosuppression, infection rates and recurrences are low, however, length of stay is prolonged in this challenging group of patients.